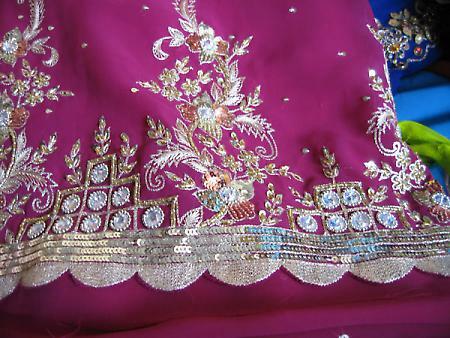 Embroidery done with metallic threads is called kalabattu and forms the zari. The main zari production centres are Surat in Gujarat and Varanasi in Uttar Pradesh. Here the metal ingots are melted into metal bars called pasa from which lengths are got by beating it after treatment. This is then pulled through perforated steel plates to make it into wires, followed by the tarkashi process to make it thin with rubber and diamond dies. The last stage is called badla where the wire is flattened and twisted with silk or cotton thread to become kasab or kalabattu. This has uniform evenness, flexibility, softness, and ductility. Kasab can stand for real silver / gold, as well as for plated silver/gold or for an imitation in which a copper base is given a coat of silver or golden colour to make the product less expensive. 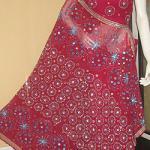 Zari thread is used widely in weaving but more selectively in embroidery. For intricate patterns gijai or a thin, stiff wire is used";" sitara, a small star-shaped metal piece is used for floral designs. 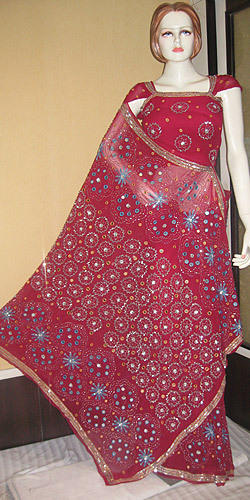 This type of embroidery is called salma-sitara. The thicker kalabattu is a braided gold thread used for borders while the thinner variety is used at the end of the drawstring of purses or batwas, and in tassels, necklaces, and strings. Tikora is a gold thread spirally twisted for complicated designs. The dull zari thread is called kora and the more shiny one is called chikna. The equipment that is used for embroidery is a rectangular wooden-frame called karchob and a wooden leg called thapa used for sewing laces. Listed below are different kinds of zari work. Zardozi : This is a heavy and more elaborate embroidery work which uses varieties of gold threads, spangles, beads, seed pearls, wire, and gota. It is used to embellish wedding outfits, heavy coats, cushions, curtains, canopies, animal trappings, bags, purses, belts, and shoes. 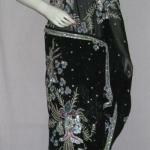 The material on which this kind of embroidery is done is usually heavy silk, velvet and satin. The kind of stitches found are salma-sitara, gijai, badla, katori, and seed pearls, among others. The main centres are in Delhi, Jaipur, Banaras, Agra, and Surat. The old teach the young and the skill continues from generation to generation. Kamdani : This is a lighter needlework which is done on lighter material like scarves, veils, and caps. Ordinary thread is used and the wire is pressed down with the stitching producing a satin-stitch effect. The effect produced is glittering and is called hazara butti (thousand lights). Mina Work : This is thus called owing to its resemblance with enamel work. The embroidery is done in gold. Kataoki Bel : This is a border pattern made of stiff canvas and the whole surface is filled with sequin edging. A variation of this border technique is lace made on net and filled with zari stitches and spangles. Makaish : This is one of the oldest styles and is done with silver wire or badla. The wire itself serves as a needle, piercing the material to complete the stitches. A variety of designs are produced in this manner. Tilla or Marori Work : This is the kind of embroidery where gold thread is stitched on to the surface with a needle. Gota Work : The woven gold border is cut into various shapes to create a variety of textures in the patterns. In Jaipur the border of the material or sari is cut into shapes of birds, animals, and human figures, attached to the cloth, and covered with wires of silver and gold";" it is surrounded by coloured silks. The work resembles enamelling. Kinari Work : A small variation is kinari work where the embellishments are done only at the edges in the form of tassels. This is done mainly by men and women of the Muslim community. The areas in which zari embroidery is practised include Kashmir, Delhi, Agra, and Lucknow in Uttar Pradesh, Ajmer in Rajasthan, and Bhopal in Madhya Pradesh. The batwas (small purses) of Bhopal are very well-known and are used for storing small coins, betel nuts, scent bottles, and the like. The other centres are Mumbai, Hyderabad, and Chennai, along with other places in the south.